"Rivers of pictures and flows of Words"
It promotes through the arts watershed awareness. Through our annual art and poetry contest and with the help of our educator's handbook, helps about 50-100 classes each year of the same watershed to begin exploring the natural and cultural history of their own river. This program offers a multidisciplinary approach to bringing nature and art into the classroom. It invites students (from 4 to 16 year old) to explore throughout several expeditions their own watershed, discover its importance in their lives, and express what they've learned, felt and observed in words and images (painting 1m50x2m50 and or a poem). All these paintings are composing a big exhibition which travels throughout the watershed to develop its inhabitants' watershed awareness. The impact of the project: methods of analysis. 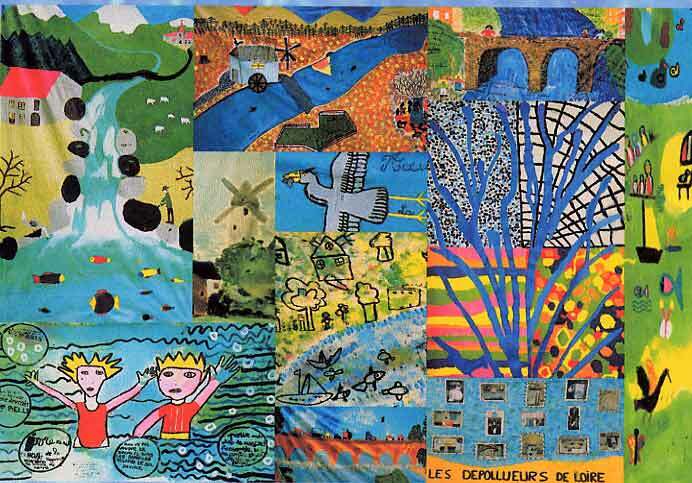 In 1997, Roberto Epple, ERNs Founder President ( ERN is a European Network of NGOs working for rivers protection) ERN set up, with it's regional Partner SOS Loire Vivante, an educational project on the Loire basin, "Rivers of pictures and flows of Words" . The project has bee inspired by the very succesfull project "River of Words", originally launched by the International Rivers Network in USA. In France, the project was successfull with a large participation: over 14 500 children distributed on the 15 départements of the Loire river basin from 1997-2004, more then 30 exhibitions. For pictures and docs go to our french pages of the project. In the same time, another project has been implemented on the Elbe riverbasin ( Czech Republic and Germany.) 180 schools distributed on the whole Elbe river approached the scientific aspects of the river (water analyses, measure of pollutions, biological indicators) in the framework of the educational project "Schools for a living Elbe" in cooperation with the DUH (Deutsche Umwelthilfe). This project is know a independent program of the Lebendige Elbe Project. The project is after years of experience, ready to be adapted for other River Basins. (under work : Rhone, Ebro, Danube). It aims at developing, through art, children awareness of rivers ecological problems to prepare them to be the future citizens responsible for tomorrow's water. The project takes the shape of a poetry and art contest for schools (from primary to high schools) of the whole Loire river basin. the banks that stemming it"
Children are invited to explore their local river, their own spot of Loire, under its ecological and also cultural aspects, and to talk about it through a collective work of art, plastic or poetic. To accompany them in this research, a pedagogical guide was conceived for this project, which mixes an emotional with an objective approach. Children are invited to explore their local river together with local actors (NGOs for environmental education, fishermen associations, artists, etc. ), these local examples being the thread allowing to evoke all subjects, the result of this research being expressed through art. In this way, the artistic realization is supported by reality, which should appear in the work of art, the various works from the different local rivers therefore carrying knowledge of the basin. One of the main preoccupations of the project is to ensure that children efforts won't be discredited. "Rivers of pictures and flows of Words" is a contest, but it is in the first place a mean to create a dialogue between the Loire of the Mont Gerbier de Jonc (the source) with the estuary, including all tributaries, as well as tributaries of tributaries. First, the collective work of art is the result of a work on environmental education. This work starts from the exploration of the river and go through the sharing of the results, a common reflection, the participation of everyone. The contest also name winners but we insist on the worth of the work of each class through a strategy of exhibition of all the works (exhibitions all along the Loire river, publications, online publishing). To experience this responsibility prepare the ground for future behaviours respectful of environment. This "ecological address" allows the child to define him/herself within a natural entity based on the river and its tributaries. This helps him/her realize the necessity to better know and better protect the rivers. The contest, by developing the idea of belonging to the Loire basin, develops an ecological awareness: you have to protect your stream to protect the river downstream, the global health depends on the action of everyone on a local level. Therefore, whatever the town they come from, the pupils realized they belong to a whole, as a poem - written by children from Nantes and addressed to children upstream - can show : " Be careful not to pollute our river because we, at the estuary, we gather everything !" fantasy here is a vehicle allowing to translate reality in a richer, more global way. The awareness that local heritage is a part of a wider heritage allows the child to realize what its place is in the community, which is made of a geological history, microclimates, specific fauna, flora and cultural traditions. The aim is that the child lives this responsibility in a concrete way, including him/her in an educational project worked out through a collaboration between the schools and the local actors of an area. To take part in the contest is to take part in a dynamic of exchanges where everybody is telling, through its art, its river story while discovering the rivers of the others. Each work of art represents an interpretation of the local river heritage and the exhibition of the works is a way to re-form the basin in a symbolic manner. The exhibition "strategy" therefore allows to develop the children's work and gives all its dimension to art as a vehicle for communication and knowledge. intended to travel along the river and its tributaries. The schools of the whole River basin put their works at the disposal of ERN for the itinerant exhibition. Everybody, children and adults, living along the river, are invited to consider their belonging to the basin and to discover the treasures and the diversity of its natural heritage. The winning works are also presented on Internet. The potential extensions of the project. They are numerous: exhibitions of the children's works together with those of local artists in various types of cultural places (local galleries, "Loire houses", etc. ); operations showing the value of the river heritage (local history, ethnography); artistic events; theatrical events on the theme of the river; plastic creations born from this dynamic around the river heritage: installations, events on natural sites, etc. - which can be read in the artistic work : the jury noted that the works were the results of a real research : references to fauna and flora, pollution, elements of the local river. the school teachers revealed that a deep work on ecological awareness was present during all the contest, going along an active, creative and emotional participation of children. The participating classes are invited to describe their approach in a systematic way : from which angle did they explore the river, which tools did they use, what were the concrete results and how those have been brought into play in the artistic creation. A summary of their discoveries has to be joined to their artistic work and this document is presented to the jury when the winners are selected. To search for indications (for example, to determine which fish species are living in a river) will make the child become familiar with documentary research or interview methods (ethnology, sociology, journalism) with its varying reliability (necessity to decipher, to match up with other sources of information). Knowledge is nourished through different ways: for example, the underlying impregnation born when all the readings of the year were on the theme of the river. In a perspective of pedagogical support, of an assessment of the project and also to create a network linking all the educational projects on the European basins, a pedagogical meeting took place in the Château de la Source on the 12th and 13th of June 1999. This event was the opportunity for different actors working on the Loire river to meet (Water Agency, Maison de Loire, environmental NGOs, inspectors of schools, etc). They shared their experience with teachers from the Loire basin and with German and Czech teachers working on the Elbe basin. Since its last edition, an assessment form about our programme was given to all the teachers to put in light the positive and the negative. This assessment is very clear and shows that the richness and the originality of our pedagogical guide are really appreciated by teachers. The project, renewed each year, is a long term project. With the creation of a growing network of actors and the appearance of local and as well as cross-country dynamics (inter-basins exchanges), the project will inevitably grow. Continuity is an important aspect of the project, the results of the work with the pedagogical guide have to be communicated, exchanged and shared to stimulate a dynamic around the basin concept as well as actions for environmental protection.